If you’d like to try your hand at homemade whiskey, corn whiskey is a great one to start with. You’ll need to create a corn mash with a few basic ingredients (like crushed corn, malted barley, yeast, and sugar). 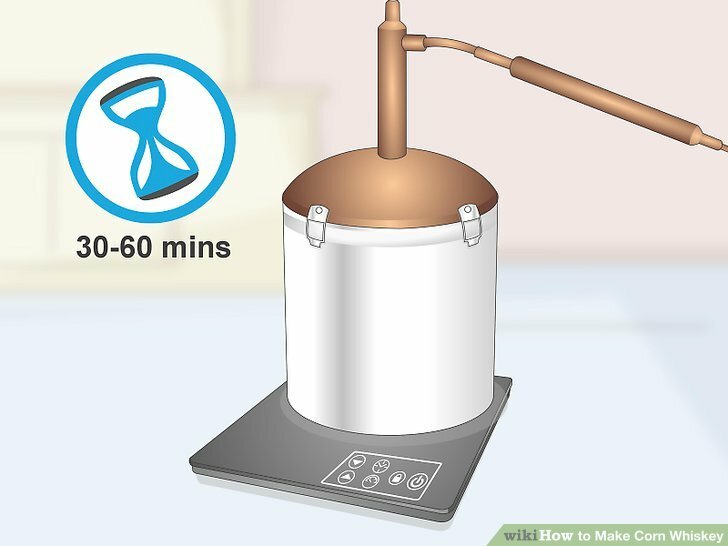 Strain the liquid and distill it in a pot still. With a little time and effort, you’ll soon be enjoying your own smooth, corn whiskey. 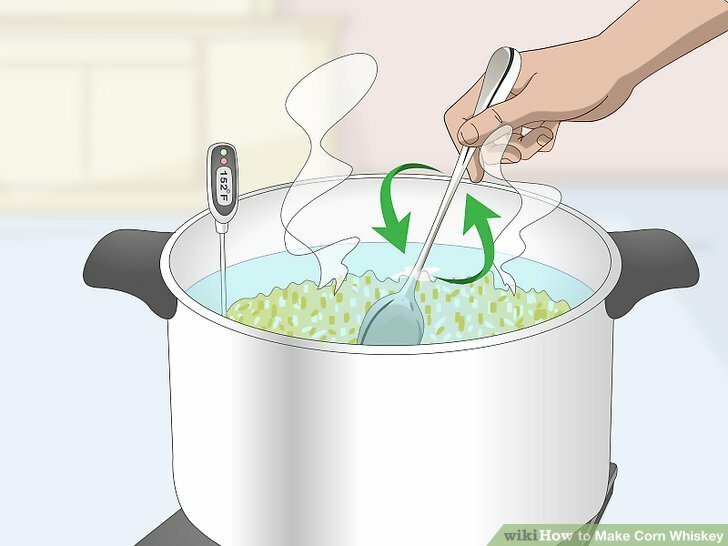 Set a large pot (at least 8 gallons or 30 liters in size) on the stove. 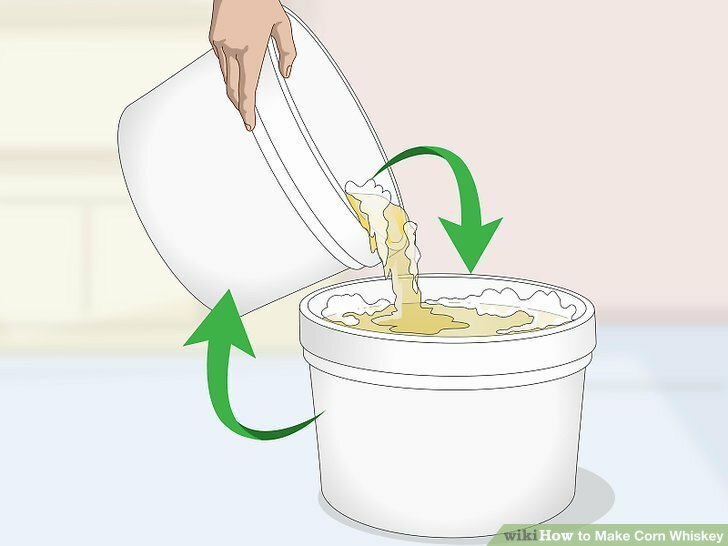 Pour in 5 gallons (19 liters) of water and put the lid on the pot. 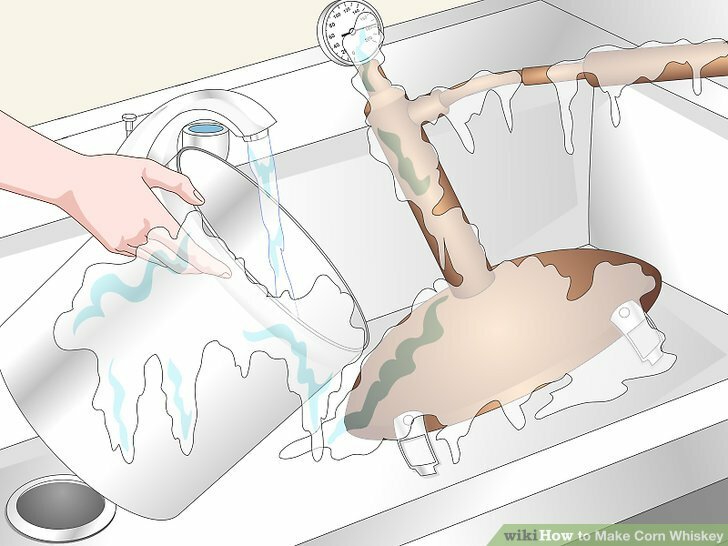 Turn the heat to high and heat the water until it reaches 165 degrees F (70 C). Turn off the heat. 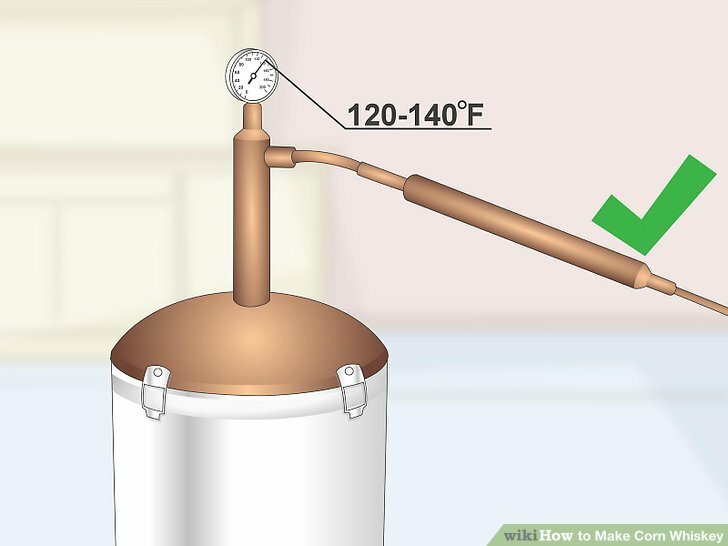 You should use a brewer’s thermometer to make the corn mash and throughout the distillation process. Stir in the crushed corn. 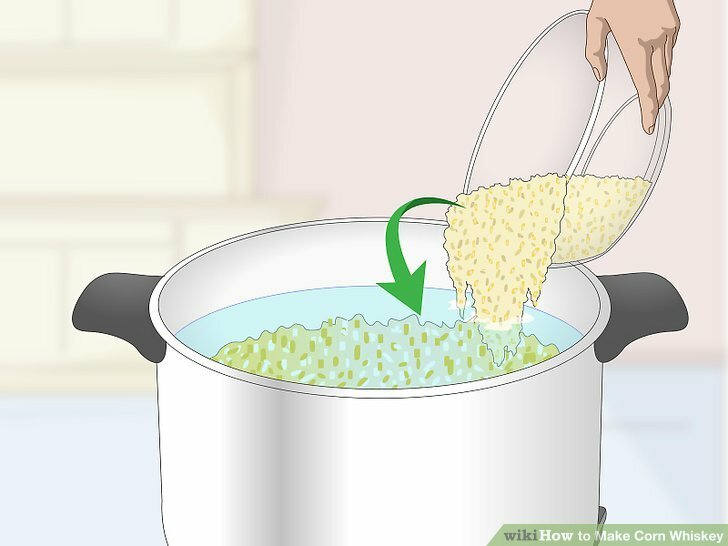 Take the lid off of the pot and pour in 8.5 pounds (3.85 kg) of crushed corn. Set a timer and use a long-handled spoon to stir the corn constantly for 3 to 5 minutes. 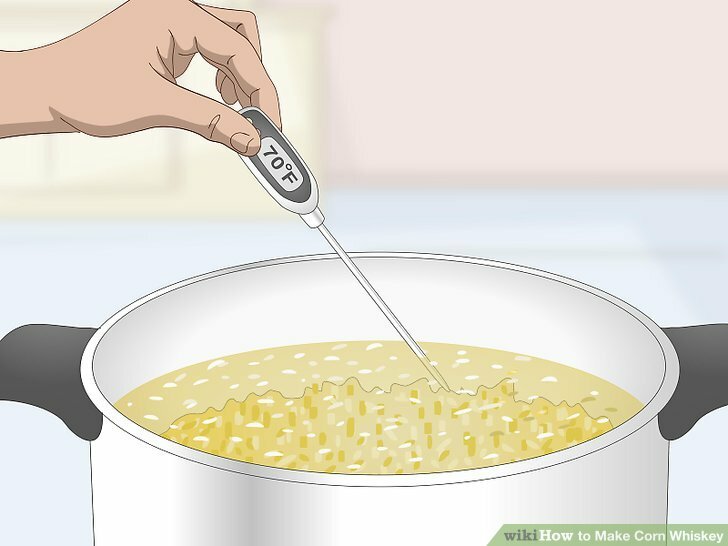 Stir the corn and check the temperature. Once the timer goes off, set the timer for another 5 minutes. 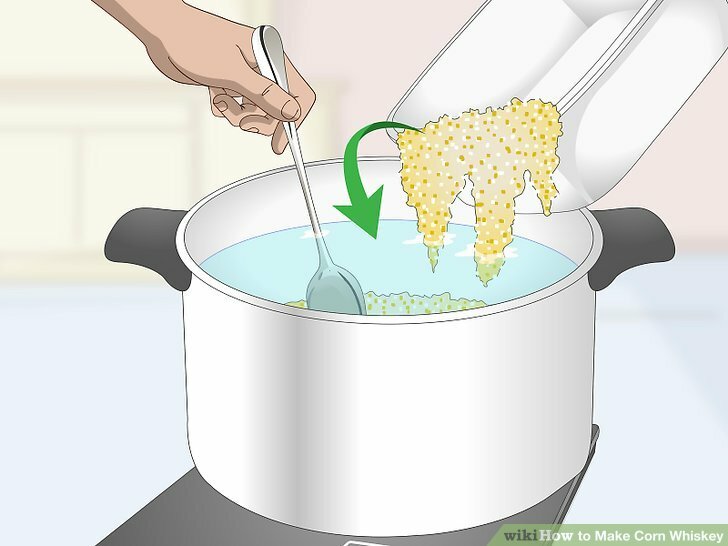 Instead of stirring constantly, you only need to stir the corn for 5 to 10 seconds once the timer goes off. Continue briefly stirring the corn every 5 minutes until the temperature reaches 152 degrees F (37 C). The corn will start to gel up when you stir it. This is because the starches are releasing and the mixture is thickening. Stir in the malted barley. Turn off the heat and stir in 1.5 pounds (0.7 kg) of crushed malted barley. Stir it constantly for a minute or two. Put the lid back on the pot. This corn mash will start to thin out after you’ve added the malted barley. It’s important to use malted barley, since it has the enzymes you need to turn starch into sugar. You’ll need that sugar to ferment the corn. Avoid using regular flaked barley. Let the mash rest for 90 minutes. This will give the grain (the malted barley) a chance to turn starch into sugar. You don’t need to stir it or check the temperature as it rests. You can make the yeast starter while the mash is sitting. 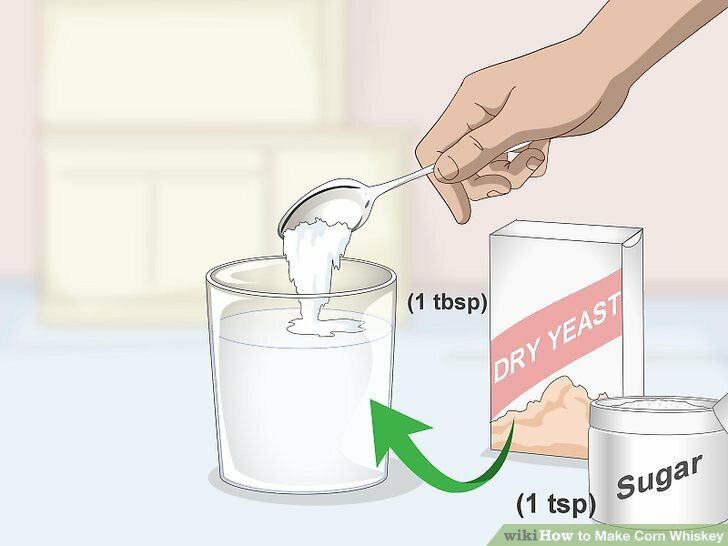 Pour 1 tablespoon (14 g) of active dry bread yeast into a glass of warm water. The water should be 110 degrees F (43 C). Stir in 1 teaspoon of sugar until the yeast and sugar are dissolved in the water. The yeast starter will ensure that the yeast is good and active before you add it to the mash. It will also get fermentation started right away. Check the temperature of the corn mash once it’s rested. It should be around 70 degrees F (20 C) before you add the yeast mixture. You can either let the mash continue to sit or use an immersion chiller to cool the mash. The immersion chiller is also known as a wort chiller. Set a clean bucket next to the pot of corn mash. 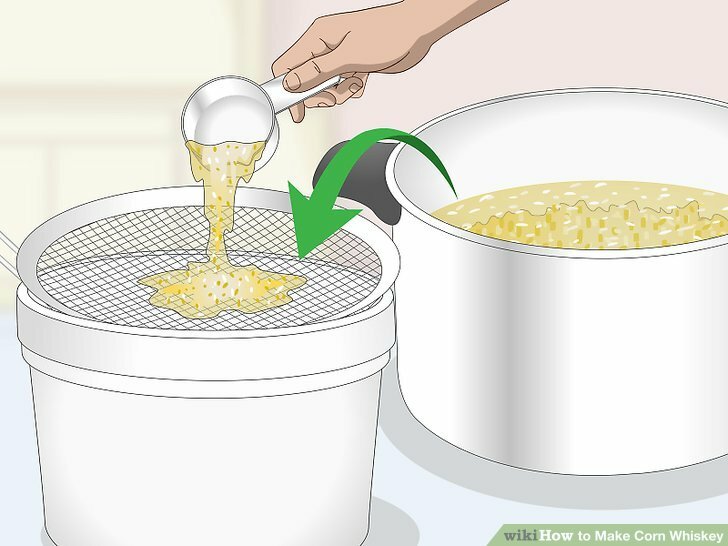 Place a fine mesh strainer over the bucket and slowly pour the corn mash through it, so the liquid passes into the bucket and the strainer catches the solids. Or you could scoop small amounts of the mash into a cheesecloth bag and squeeze the bag over the clean bucket. You can discard the grain solids. The liquid that you’re left with after straining the solids is called wort. 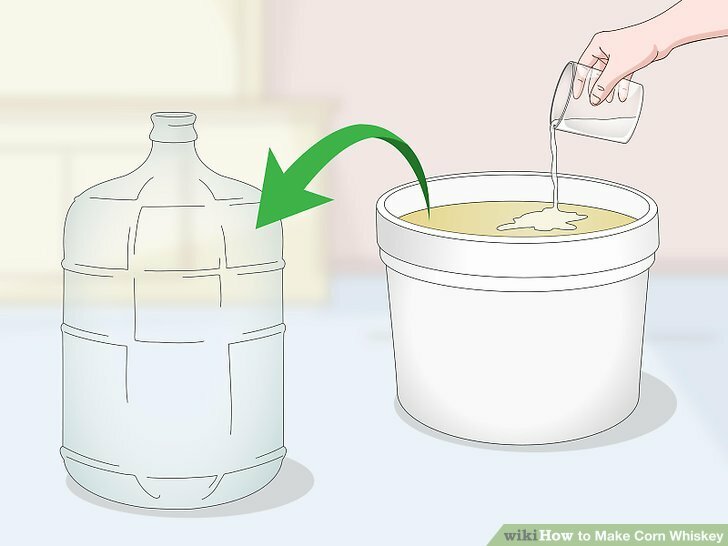 If you squeeze the corn mash in the cheesecloth bag, you can actually squeeze more liquid out of the mash which will get you more corn whiskey in the end. To aerate the wort, you want to agitate or move the liquid around, so you introduce air into it. Set out two sterilized buckets. Pour the wort into one bucket. Continue to pour the wort back and forth between the buckets, so you see bubbles and froth at the top of the liquid. You’ll probably need to pour them between the buckets 10 to 15 times. Introducing air will give your yeast oxygen that it needs to grow. Take a specific gravity reading. 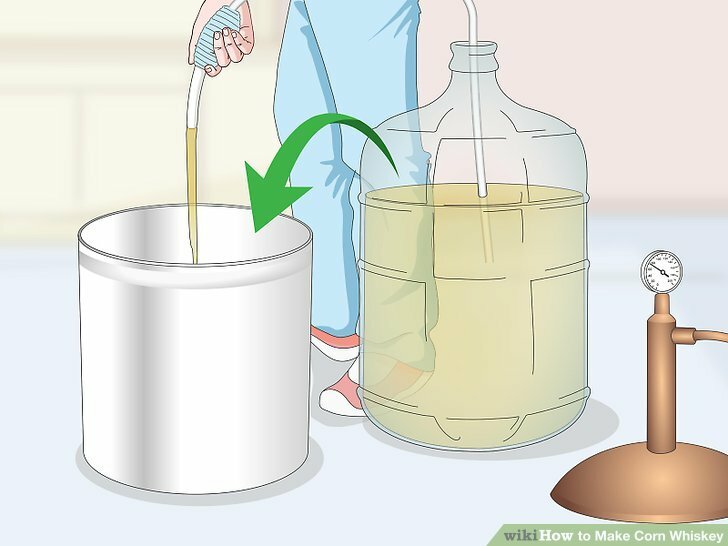 Fill a sterilized test tube with some of the wort. Place a clean hydrometer into it and swirl the liquid a little. The hydrometer will float around and then settle into one spot. 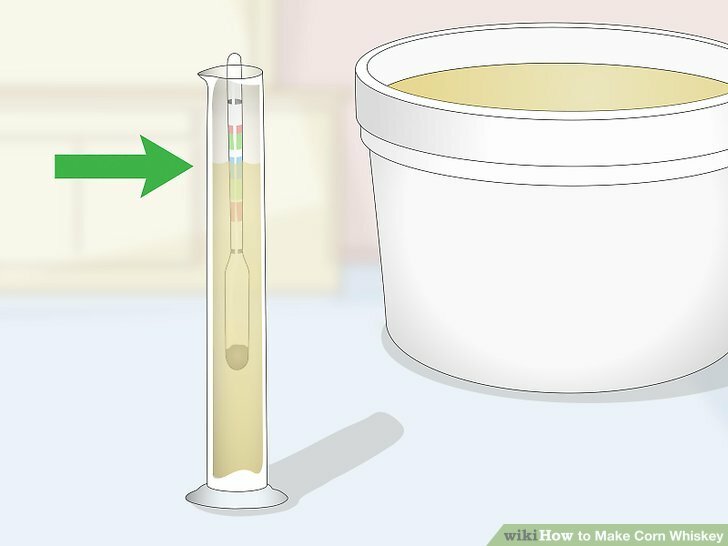 Take the specific gravity reading by seeing where the top of the liquid reaches the hydrometer. Write down the specific gravity reading. You’ll use this specific gravity reading and one you take after fermentation to determine alcohol content. Add the yeast mixture to the wort. Pour the glass of water, yeast, and sugar into the wort. Once you’ve added the yeast, the wort is now called wash. Place a large plastic funnel into the container where you’ll ferment the wash. Pour the wash into the container. 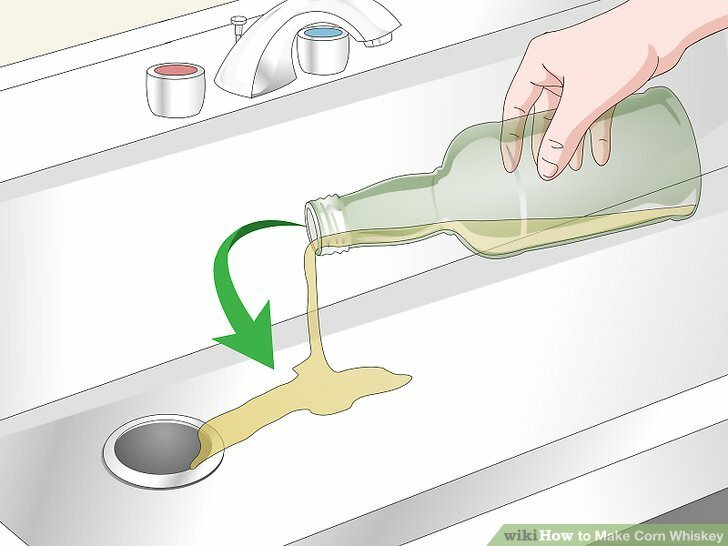 The funnel should be clean and sterilized, so you don’t introduce bacteria into the wash.
For example, you could use a 6.5 gallon (24.6 liter) glass carboy. Fill the airlock halfway with water and push it into the bung that it came with (this will be made of rubber or cork). Push the bung into your carboy or fermenting container. The container should now be well sealed. You can make your own airlock using zip ties, a rubber stopper, and rubber hose. Or you can purchase one. Let the wash ferment for at least one week. 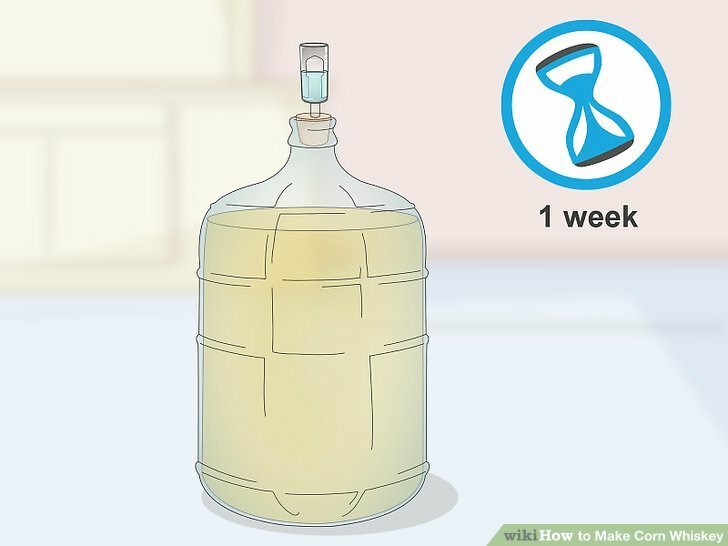 You can ferment the wash for up to three weeks. The wash will bubble while it’s fermenting, so just leave it alone until it stops bubbling. Avoid moving or handling the wash while it’s fermenting. Siphon the wash into a still. Once the wash has stopped bubbling, you can transfer it to a pot still. 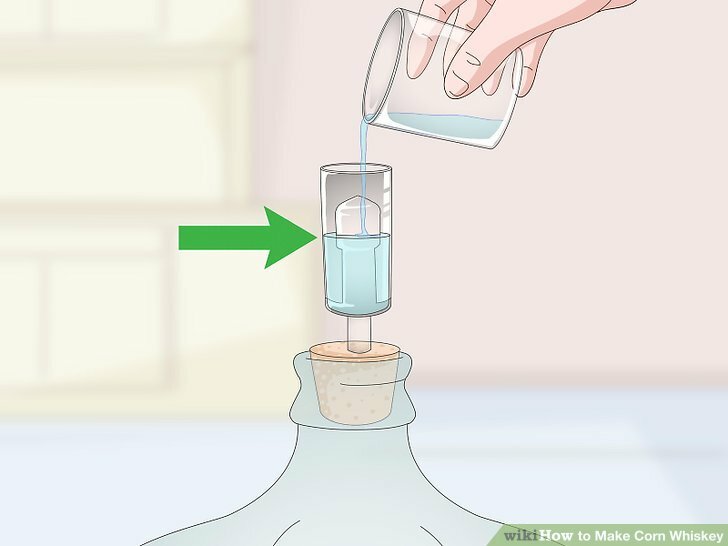 Use a siphon to get it into a still, so the sediment and solids are left in the bottom of your fermenting container or carboy. Avoid pouring the wash into the still, since this will agitate the liquid and mix the sediment back into the wash. If you don’t want to siphon the wash, you can strain it. Place cheese cloth over the still and slowly pour the wash through the cheesecloth. Keep in mind that some sediment may end up in your still. Heat the wash for 30 to 60 minutes. Set up the still according to the manufacturer’s instructions. Turn on the still and slowly heat the wash over medium to medium-high heat. 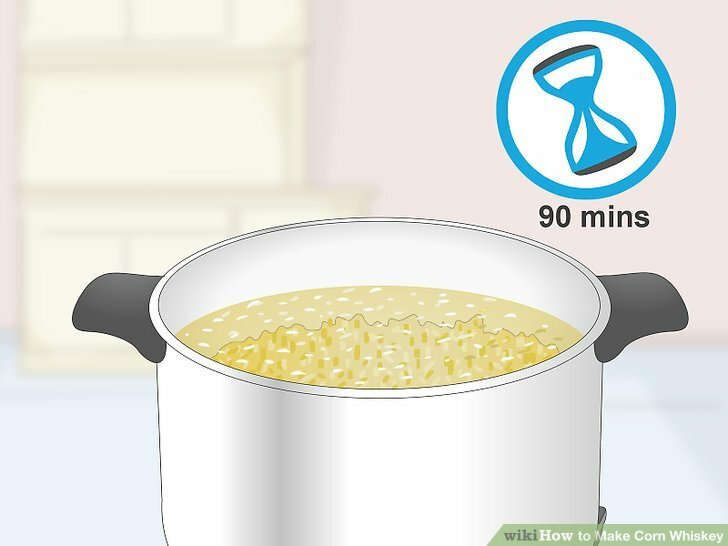 You should heat the wash for 30 to 60 minutes, so it comes to a boil. Avoid heating the wash over high heat. This could cause your wash to burn. Check the temperature and turn on the condenser. Watch the temperature of the wash. Once it hits between 120 and 140 degrees F (50 to 60 C), turn on the condenser. You should begin to see liquid dripping out of the condenser tube. Remove and throw out the heads. Your corn whiskey is now distilling, but the earliest liquid that is fermented is not drinkable. 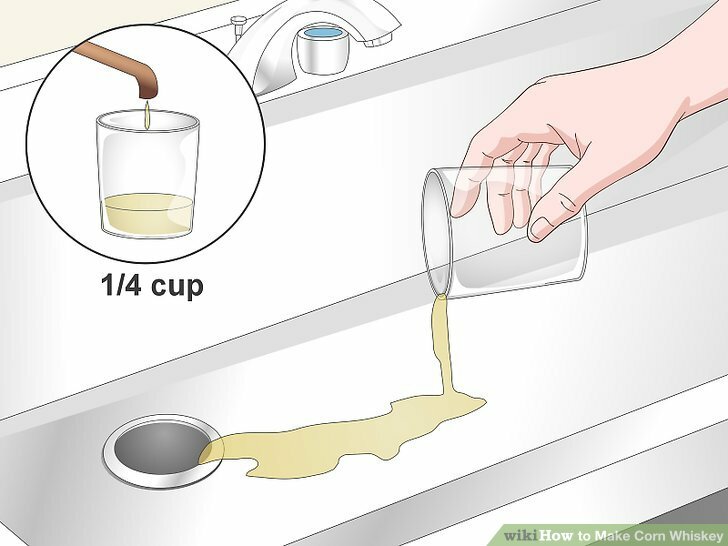 Remove the first 1/4 cup (60 ml) of liquid (the heads) that comes out of the condenser tube. The heads have a higher concentration of methanol and volatile compounds that shouldn’t be in your corn whiskey. Once you’ve removed the heads, you can begin collecting the usable corn whiskey. To make it easier to handle, collect the corn whiskey in 500 ml (about 2 cup-size) bottles. Continue to check the temperature. It should be between 175 and 185 degrees F (80 to 85 C). When the temperature reaches 205 degrees F (96 C), you’re not collecting the body of the whiskey anymore. Stop filling the 500 ml bottles. Instead, throw away the tails. The tails are known as fusel oils and they can ruin the flavor of your corn whiskey. Turn off the pot still once you’ve finished distilling the corn whiskey and have discarded the tails. Turn off the condenser tube and let all of the equipment cool down. 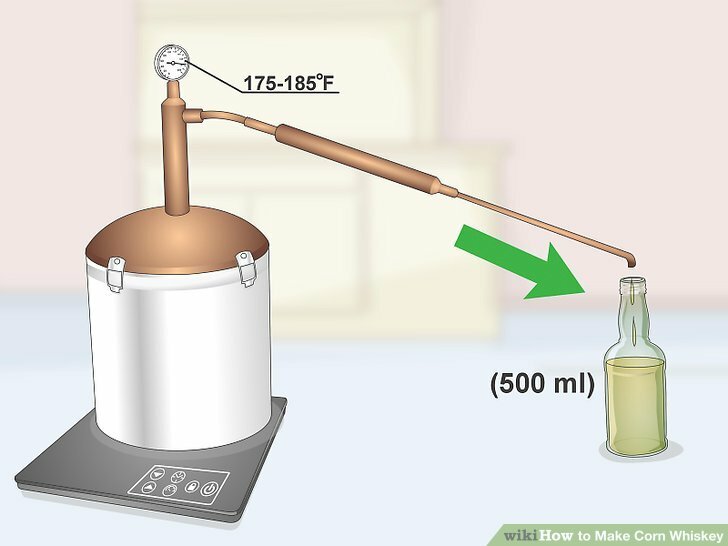 Follow the manufacturer’s instructions to clean the still completely. Dilute the corn whiskey with plain water. Unlike other types of whiskeys, corn whiskey does not need to be aged before you enjoy it. If you’d like to begin drinking your corn whiskey, dilute it first to make it smoother to drink. Start with a small amount, so you can find the ratio you like. 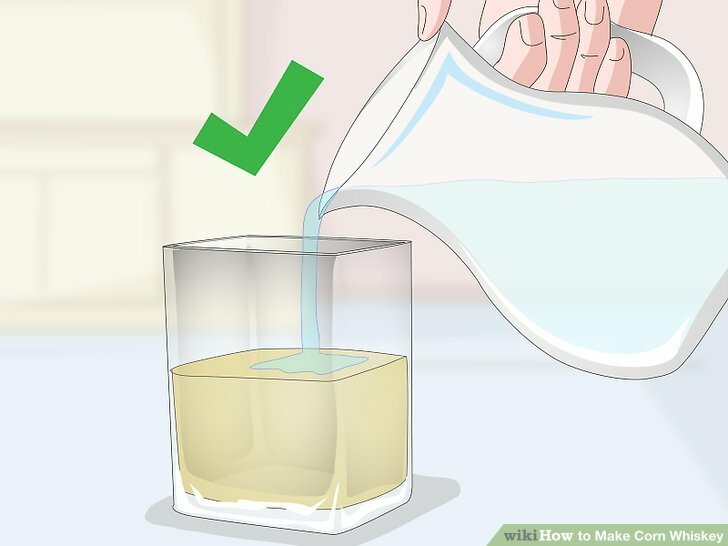 For example, mix 1 cup (240 ml) of corn whiskey with 1/4 cup (60 ml) water. If you’d like a mellower flavored whiskey, consider aging the corn whiskey for several months before you enjoy it.